Himachal Pradesh has a rich tradition of handicrafts. These craft items are woolen and pashmina shawls, carpets, silver and metal ware, embroidered chappals, grass shoes, Kangra and Gompa style paintings, wood work, horse-hair bangles, wooden and metal utensils and various other domestic things. Pashmina shawl is one of the products which is popular not only in Himachal but all over the country. But lacks of market facilities, these artistic and elegant handicrafts were not sold very much. Though, the demand for handicrafts has increased within and outside the country. Anglo-Indian architecture church in Shimla. Himachal was one of the few states that had remained largely undamaged by external customs, largely due to its difficult territory. The condition of state changed drastically with the technological advancements. It is a multireligional, multicultural as well as multilingual state like other Indian states. Most commonly spoken languages include Hindi, Punjabi, Pahari, Dogri, Kangri and Kinnauri. Himachali caps are also famous art work of the people. Due to extreme cold winters, there is necessity of wool weaving. Shawls of Kullu are famous for unique patterns and lively colors. 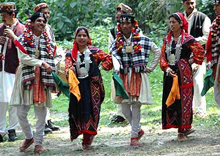 Typical local music and dance reveals the cultural distinctiveness of the state. These dances are performed during local festivals and other special occasions. The eatables used by Himachal Pradesh people are lentil, broth, rice, vegetables and bread. non vegetarian items are more preferred. 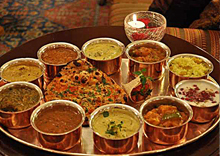 Some of the specialities of Himachal include Pateer, Chouck, Bhagjery, Patrode, Beduan and chutney. Many well-known people came from Himachal. English author Rudyard Kipling, Indian film personalities Dalip Singh Rana, Anupam Kher, Preity Zinta, Amrish Puri and Prem Chopra, economist and former vice-president of World Bank Shahid Javed Burki, Satyananda Stokes who introduced apple in the region, writer Idries Shah, ornithologist Allan Octavian Hume, former general of Pakistan Muhammad Zia-ul-Haq and current President of Afghanistan Hamid Karzai are the famous entity related to Himachal Pradesh. Himachal Pradesh is also attracted tourist for adventure sports. A lot of people visit Himachal in the winters too, for exploring the several opportunities the state offers for winter sports. To conclude, HimachalPradesh is varied in its rich culture. Diverse traditions of this state are represented by Saints, philosophers, music, handicrafts and its festivals with all their colorful rituals and ethnicity. It is advisable to visit the state is during the summer months, basically from April to July and again from September to November.